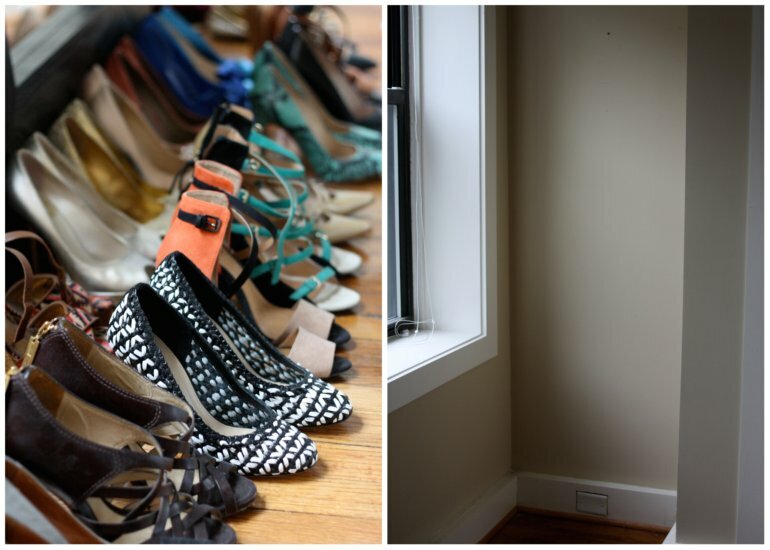 Like many women, I've collected a fair amount of shoes over the years. That's not the problem. The problem is how to store them in an apartment with very little closet space. At first, I tried keeping all of them in their shoe boxes, stacked neatly on my closet shelves. However, I found this method didn't give me a clear view of all of my shoes and often ended in shoe box avalanches when I was in a hurry. So I next tried displaying them proudly on a bookshelf, but... I really didn't like the way this looked. It felt cluttered. Then I found this LuckyMag article titled "Hang Your Party Heels Like Fine Art". It got me thinking... I have this nook in my room that previously housed my dirty clothes hamper and a few pictures on the wall. This nook would be a perfect place to hang my shoes like art! As a renter, I try to avoid putting holes in the wall when possible. So the idea of nailing in a bunch of photo ledges (as Lucky did) didn't have me sold. After a few weeks of discussing the idea with my handy hubby, he suggested we try using tension rods instead. The whole piece took about 30 minutes to install. Below is our final masterpiece. I used 6 tension rods for a cost of under $25. I spaced each tension rod about a foot a part. This will vary depending on your shoe size. The masking tape is used to cover the wall where the heels hit to avoid scuffing. What do you think? If you give it a try, send me some pictures! I want to see! Love this idea! That's my kind of statement wall! This is an EXCELLENT idea! I, too, have a really random nook in my bedroom that currently just houses junk and my suitcase, and I could totally put shoes and purses on tension rods! Thank you, thank you! Great idea!! i'm totally doing this in my closet! I just have a stack of boxed taking up space! this is a great idea, since my closet fell I can use some space i have in there for this! and it's cheap! This is awesome Tammy, it looks terrific! I've been looking for a great photo of this shoe solution! I hope you don't mind I'm referring to this solution on my Hidden Storage Event this month at Niche Designs Inc. This is great and now I wish I had a nook! Me too, Me too. I will spray my shoes often with a de-odorizer. What abt flat shoes? Does this solution work? Oh i'm sure going to try this.. thanks for the great tip.. I try to Organized spaces much as I can, help keep my place much cleaner and larger space. Love the shoe storage from Bizarkdeal for my shoes. Easy to setup and use right away. I don't own a lot of shoes, but what I do own becomes a big, annoying little pile in my closet. This fits perfect in a somewhat small closet without taking up a lot of room - I use the top part as an extra shelf too, putting some shoe boxes and other little annoying things to clear up the floor. I really like your idea but I'm wondering how much weight each tension rod can handle? I wear a size 10 shoe and have ankle boots etc. Do you only recommend using for high heeled shoes? By The Way thats a nice Shoes Collection. his is really very nice blog and so informative. Thanks a lot for sharing this article. HiringThing is online software that helps companies post jobs online, manage applicants, and hire great employees. This module provides a Drupal block with the HiringThing embeddable jobs widget that allows companies to add a list of jobs to their website.